Day 2 and our final contribution to this science session. The role of the forecaster dominated the morning session on applications of meteorology in warning of severe weather and other natural hazards. 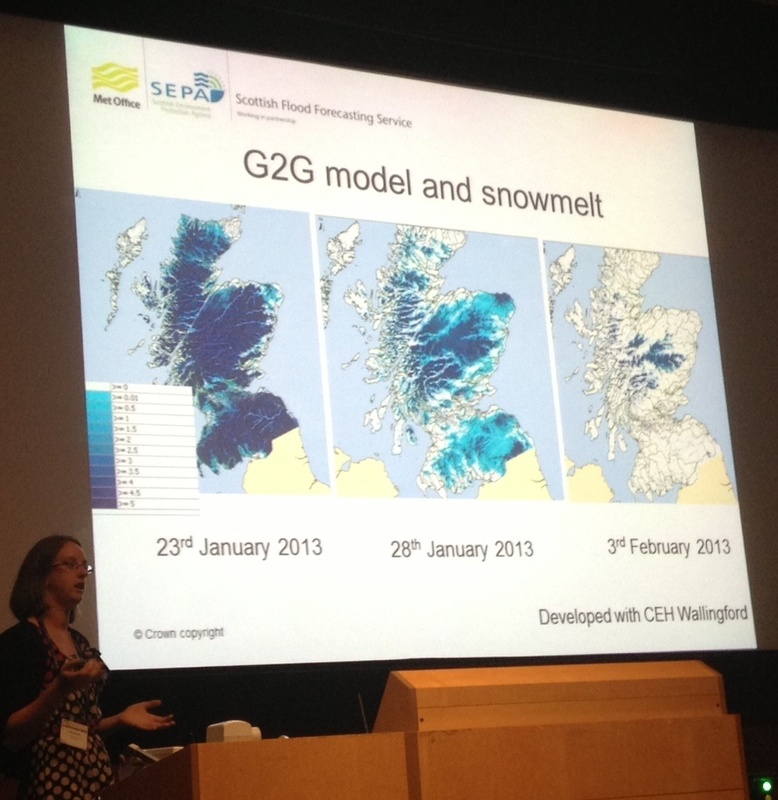 Linda Speight presenting on the role of the forecaster in Scotland. Automation of warnings was presented (Reichert) allowing for greater situational awareness for the forecaster, followed by giving forecasters improved understanding of vulnerability and exposure on a global scale (Titley). The ever increasing role of new capabilities now places a growing role in decision making not forgetting the intangibles such as the need for experience and to consider non-scientific matters when alerting (Speight). For the afternoon sessions the focus shifted to verification. It’s clear that there are many issues to consider here, and the method chosen will have to depend on the particular model and circumstances in question (Ebert). The importance of public confidence, and communication of uncertainty was stressed by several contributors, and the question as to whether we should be focussing on the more visible forecasts of extremes, or more properly looking at the whole range (Lerch). Operational forecasters are taking uncertainty into account anyway when making decisions (v der Plas) but there is still a need for objective measures of accuracy. It was also stressed by many contributors (Mittenmeier) that higher resolution forecasts present greater challenges for verification, with greater danger of falling foul of the verification “double penalty”. The way forward therefore must include neighbourhood sampling methods. This entry was posted in Conference, Risk communication, Weather prediction. Bookmark the permalink.